This looks like such a fun thing to do! Good for you for getting out there and finishing the course. I on the other hand would be in the hot tub! Love this line and especially how you mounted your entire layout on Kraft Paper. I am loving Kraft Paper right now! Fabulous finish and even better layout! Happy New Year! Love your double pagers and the theme you scrapped about! Love that you were one of the many Santa! What a SPIRIT! It was fun reading your blog about the layout! Your layouts are beautiful and very festive! I love how you matted your photos with the red cardstocks as they popped well! Fantastic page, you rocked it! Love the story to, so fun! 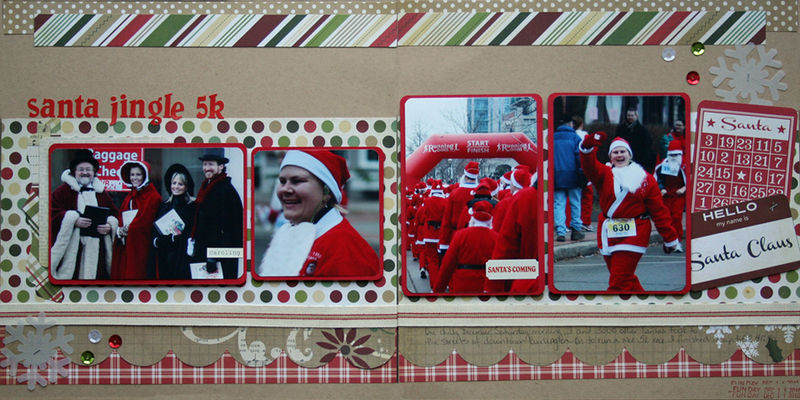 Totally awesome page (love the kraft with the Christmas papers) and it looks like you had fun!